Thursday, June 16 Every story has a beginning. Perhaps this one starts on a sunny morning in late May, 1974, when I crested a rise on US 85 east of Cheyenne, WY and saw the Rocky Mountains, in, as the late John Denver would describe it, "the summer of my 27th year, comin' home to a place I'd never been before." It was like the first kiss from a woman who would become one's life long lover, never to be forgotten. Such a kiss would begin my fascination with the western mountains and its canyons, and draw me like a powerful magnate to its sometimes-hidden treasures. I think it would only be a matter of moments before I knew I had to be closer than the paths of my career would ultimately take me. Or maybe it begins on a blue-cold afternoon in late January, 2002, with nearly 250 backpacking trips under my belt, more than 60 in the western mountains and canyons of the United States, finishing up a day-long cross country ski trip into the near-interior of Yellowstone National Park, with our long time friends Carolyn and Scotty, and our soon to be new friends David and Patti, as we would ski out of the Fawn Creek drainage on the western edge of Yellowstone National Park through waist-deep powder. I knew then in my heart that it would be Bozeman, MT, where we would plant our flag. Or maybe it begins with a visit from my 87-year old father, beginning in late May, 2005, during an unusually wet spring in Bozeman. After two weeks of being more sedentary that either Susie or I feel comfortable with, I was ready to get OUT!! Sure, we had taken a superb backpack in Southern Utah, seeing canyon bottoms that had revealed, in some cases, their secrets for the first time in 40+ years. But I was desperate for a LOCAL backpack. One in which you throw your gear in the back of your vehicle and head to a trail head whose distance is measured in hours, not days, away. Susie had taken a very long and arduous day hike with the so-called BWAGs the previous month on a less-than auspicious day, along the Black Canyon of the Yellowstone, and she was ready to share the wonders of the low elevation parts of Yellowstone, before the bugs got too challenging. I was so ready for a backpack that we rolled out of the driveway nary 5 minutes after our good friend, Barbara from Knoxville, her ex-husband Tom (let's not go there), and grandson Tyler had backed out, following a short visit prior to their sightseeing/backpacking trip to Yellowstone and Grand Teton NP. Susie and I headed for the Mammoth Hot Springs entrance to the Park, the Hot Springs seeming to me vastly less mammoth than they were merely 13 years ago. Stuffed in the back of our van was the multi-page 11 x 17" print out of rules, regulations, and backcountry campsites for Yellowstone NP. The impression one has after pouring over such a missive is that the Park, likely from a liability standpoint (that said by someone who works with lawyers and has a deep affection for them), would just as soon you DON'T want to go backpacking. I had read through the Byzantine list of regulations, and it seemed that, if there were not TOO many people backpacking in the north side of the Park this weekend, we might be able to get ourselves a permit to take a hike in this Park. 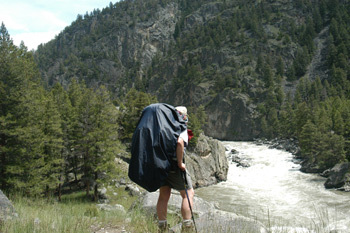 Our plan was to start near the town of Gardner, nearly the lowest elevation in the Park, and head upstream along what is called the Black Canyon of the Yellowstone River for 9 miles or so, turn upstream to the south to leave the canyon, and ultimately spend a second night along Rescue Creek, before heading back to Gardner on the third day. Susie and I discussed the proposed route with the ranger at the backcountry desk a fair amount, and agreed that we would expend the major effort on this first day, getting as far up the river as we needed to go, have an easy second day, and be out of the Park in early afternoon on Day 3, to have dinner with our now-friends Patti and David in Bozeman that evening. Permit in hand (or wallet, actually), we drove back down the road to Gardner, ready to start the trip on the river's south side, just out of town. Yes, it was mid-June, and yes, it was in the mountains, sort of, but our former weatherman back in Knoxville would have described the day as "toasty." In this country, such translates as the sun beating down on the south facing slopes with such force that it can turn a dirt slope into a desert. Such was the environment into which we hiked, starting at 10 am or so from Gardner. Susie had warned me that some of the slopes on the trail reminded her of the Goat trail in Wrangell-St Elias National Park, this country's true largest National Park (Yellowstone is "only" the Lower 48's largest NP). A "Goat-Trail-like" trail is one that "offers" very narrow tread and substantial exposure which might, given the proper circumstances, result in death or near-fatal injuries, should one slip. 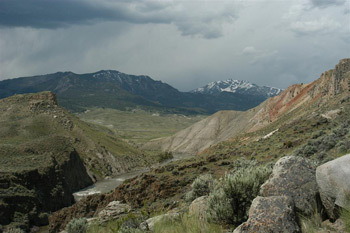 As it turns out, Susie had hiked this trail on a very rainy day, coming down hill, and thus, risks of one slipping into the raging river that is the Yellowstone swollen by snow melt, perceived or otherwise, were far greater. The trail actually starts on the outskirts of the town of Gardner, passing through an easement to get to the banks, high above the river. The trail crosses some fairly steep and exposed slopes, such that they might make my son-in-law uncomfortable with exposure. However, he might advocate railings on all trails with greater than a downslope grade of 5%. We crossed the sun-baked dirt slopes, the heat absorbed from the morning baking us on multiple sides. We could turn around and note the forecasted storm clouds brewing and bellowing, noting it would be just a matter of time before they would hit. May and June are the rainiest months in this part of the planet, and one should not venture into the backcountry without planning accordingly. It should be mentioned at this point that apparently, the ranger had become mega-confused when he wrote our permit. 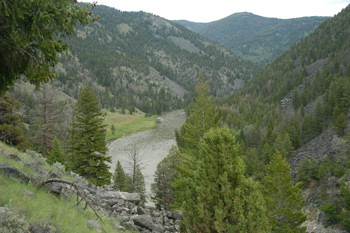 We had told him, in the end, that we wanted Site 1Y8, and he had described to us how it was located about 3/4 of mile upriver of the first huge suspension bridge over the Yellowstone. However, when he had punched the numbers into the computer, he had actually issued us a permit for Site 1Y2. (Our other site would be 1A2. Frankly, I think all these numbers and letter are confusing. Feels like a damn PIN number with your ATM Card.) I had not noticed such until I was getting ready to hoist my pack in Gardner. Susie and I discussed how we might handle this, since, by law, we should really go to the site for which we had actually been issued the permit. However, my sense was that we should head for the site that the ranger had carefully described to us how to reach. If anyone questioned us, we could explain, convincingly, what had happened. However, such is a good reminder to check your permit BEFORE you walk out of the less-than-conveniently placed backcountry permit offices. We hiked upstream, mindful of the swirling maelstrom not too far below our feet. We encountered our first party of the day, cooling off with the waters of Bear Creek, and they warned us of a rattlesnake just off the trail a couple of hundred meters upstream. It turns out that the concept was correct, but the distance was wrong: we had a chance to see our reptilian cousin (I know, right-wing, fundamentalist Christians will have a hard time with such a designation, but they can deal with such) about a half mile up the trail. He did not really buzz Susie, but he moved around a bit, just short of shaking his tale at us. It was good to see wildlife, any way you cut it. It took but a couple of hours for our blue-sky day to change to shades of grey and black, and the rain hit us just about lunch. Susie and I donned our rain gear, put on our pack covers, and girded our respective loins for an onslaught from the skies. It came hard, fast, but thankfully short, and by the time I had finished my post-lunch granola bar, the rain had stopped. Temporarily. The trail does not gain a huge amount of net elevation in the 9 miles or so between its start and the suspension bridge over the river. The emphasis ought to be on "gross elevation" here, since there is a fair amount of up or down. After lunch, we dutifully trudged along the river, at various bank elevations, and waited out another shower in the bone dry rain shadow of a tall pine. It was neat to be able to watch the intense rain from a natural "tarp" provided by Mother Nature. It was not long after such that we arrived at the first river campsite, 1Y1. Susie was reluctant to stop, but it was such a lovely spot, with its own natural sandy beach along the river, and grassy meadow, that I could hardly resist. Besides, it was easy to get down to the water here, and we needed to pump some for the next segment of our hike. We kept our relaxation to a minimum, and tried to pick up the pace, Susie acting as our resident travel guide, recounting impressions of different stretches of the trail as she had experienced them a month previously in the rain. We topped out on a steep rise, and looked down upon the campsite we had been officially assigned for the evening. It looked fine - a small open meadow along the river, but had none of the class of the previous one with the beach. 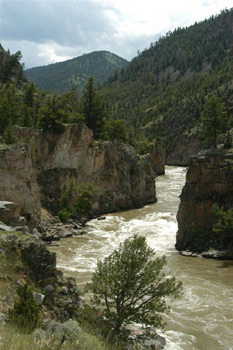 Besides, being so close to the rain-swollen Yellowstone at this point seemed to be no bargain: the river was vastly more intimidating than inviting. The trail climbs what I perceived to be steeply past the overlook of Knowles Falls, and I could tell that I was running out of gas. I was getting more than a bit frustrated that Susie, seemingly filled with boundless energy, wanted to keep going. I needed a rest break, at least for a few minutes. She confessed that the sun-baked slopes had drained quite a bit of her energy, and she was deliberately pushing before she too ran out of gas. It seemed like we were making a good bit of progress, but given the length of this first day out (nearly 10 miles), we still had some distance to go. I was frustrated from the lack of flat or gentle uphill on the trail. It seemed, although the topographic map might beg to disagree, that the route was continual up and down. Maybe, it was just me. My joy at making what I could see to be the climb up to Crescent Lake (which would signal our approach to the crossing of the Yellowstone, then not too far beyond, camp) was tempered by the realization that we were about to be slammed again by another rainstorm. Judging from the feel of the air, it seemed that this might require our suiting-up (putting on our rain jackets, as our packs had been covered since lunch. On the hill above the north shore of the lake (feeling more like a Tennessee sinkhole rather than a Lake), we congratulated ourselves on our amazing foresight: the rain did indeed slam us, with huge gusts of wind. Fortunately, the rain did not last too long, and we were underway, dropping past the lake to the east, and turning towards the bridge over the river. Since Susie had been on the route before, she was not surprised as I was to see the mother of all backcountry bridges. The bridge, a huge suspension affair, must have been 40 meters long, and appeared built for tanks, not horses and hikers. But, I guess, when you have to locate the bridge far above the water level (maybe 50 feet or so), you don't mess around when you build the bridge. You just do it. We took a few photos, and then crossed to the south side of the river, and looked for the trail junction that would signal our approach to camp. It would feel good to get there. Now, the ranger had warned us that our campsite was a ways off the trail, but I confess that I was sorta stunned when I saw a sign indicating that 1Y8 was 0.8 miles to the east. That is considerably off the trail. Privacy would not likely be a problem. 1Y8 is the second campsite along the river. We trudged past the first one, perhaps a third of a mile off the trail at breakneck speed. In addition to just getting the pack off, I was interested in erecting the tent, getting water and cleaning up before the next round of showers hit, which the sky suggested would occur sooner than later. We made it, arriving about 4:30 pm, to the edge of an area that seemed to be a cross between a meadow and open woods. The overall size of the campsite was enormous, perhaps 10 acres, with lots of potential camping spots. While the site was rationed for 6 people, it could clearly hold ten times that number. We got our tent up, our trusty, but now slightly aging, Sierra Designs Clip 3. Since we knew we would be below timberline on this trip, its non-free standing status was no problem. The tent is roomy, at least on one end, and has a nice size vestibule. We practically jogged over to the river, both our bath area and water source, as the clouds moved in. The water was not the clearest, but we figured we could clean up the drinking water with our pump, and the rest, well, a few minerals after boiling couldn't hurt. 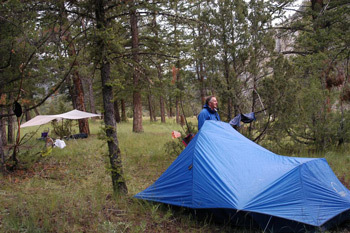 Susie dashed back to the tent, as I gathered up my stuff after dousing myself with several pots of river water. I did not quite make it bact to the tent before rain hit. I finished drying off once I dove into the tent, and put on some warmer clothes. I tried to keep warm in the tent without unpacking my sleeping bag. Not very successfully. We sorta dozed and listened to the pitter patter of rain on the fly. I was way ready for dinner, but Susie, understandably, was not very enthusiastic about cooking in the rain, nor under the fly (certainly not in grizzly country), and suggested we have some granola bars and call it a night. Well, I might have been tired, but we were not that far away from the solstice, and we had many hours to go before dark. In my head, I had been counting the duration of the showers, and most of them did not last more than 20 minutes. Just enough to give you a good soaking if you are outside, so I figured we had another 10 minutes to wait, until I could get out and set up our tarp. In another 10 minutes, as the rain was halting, I told Susie it was nuts to worry about carrying a wet tarp tomorrow, when we could enjoy a small piece of dry ground this evening, and that I was headed out to set up the tarp and begin dinner. OK, so I am not the world's greatest engineer, but with the help of a couple of hiking sticks, some compliant trees, and lots of cord and stakes, we finally had a dry cooking spot away from our tent. As we made dinner, a fox strode purposefully past our cooking area (like within 15 feet or so - we must have been on his regular route) carrying something unidentifiable in its mouth. Such was the highlight of the evening, after dinner, that is. One of my standard GPS chores was to mark where we were. Susie asked, since she knew we were close to the state line, if we were camped in Wyoming or Montana. Based on the GPS, I confidently explained that while our tent was erected in Wyoming, our food would be hung in Montana. We hoped any ambitious bears would appreciate the regulatory distinction. Anyway, the food was hung after teeth brushing. We watched the sun drop into the sky, and figured tomorrow had to be less rainy. But it would be what it would be, and the thing to do seemed to get some rest and be ready for it.